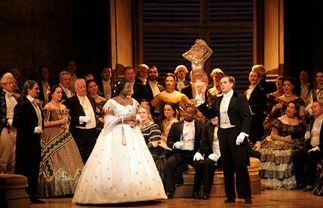 Like everywhere, La Traviata is firmly rooted in the repertoire of the Royal Opera House. Sir Richard Eyre’s sparkling production dates back to 1994 and, now in its twenty-fifth year, has been revived in at least every other season. The opera famously touches on fairy tale motifs to deliver a heartrending tragedy. Violetta, a dissolute courtesan who has lived only for pleasure, somewhat miraculously settles on the devoted Alfredo and devotes her life to true love, if only for a season. Her scandalous past haunts her, however, and Alfredo’s father covertly visits to tell her that their relationship threatens his daughter’s prospective marriage. Tenderly but cruelly, he convinces Violetta to give up Alfredo, a sacrifice for true love. The uncomprehending Alfredo takes the breakup badly, publicly insults Violetta as a prostitute, and wounds her returning rival amour in a duel before fleeing the country. As Violetta succumbs to consumption, he learns the truth from his embarrassed father and returns to her, just as she is about to expire, with time only to renew their love with words. Missed chances are a quintessential part of life, and a successful Traviata must speak to them fully. The role of Violetta is one of opera’s most challenging for the soprano voice. It is, in effect, three roles in one. The first act calls for a florid coloratura part to capture Violetta’s playfulness. In Act II this must be followed by a resolute and sacrificial dramatic soprano. The dying heroine of Act III requires a light soubrette with the life going out of her. The rising star Angel Blue, who makes her Covent Garden debut in this production, did not quiet rise to the first and third of these challenges – the coloratura runs in the famous cabaletta “Sempre libera” betrayed some hesitancy, while the death scene was a bit throatier than one might prefer. Her second act singing, however, blossomed to foreshadow a brilliant career in the heavier Verdi parts, and maybe even one day in Wagner. Her Alfredo, French tenor Benjamin Bernheim, brought a sweet, rosy sound to the part. Not all chances were taken – the end of his Act II cabaletta “O mio rimorso” ended rather flatly – but he, too, has much to offer on the stage. As the awful father, known always by his family name “Germont,” Russian baritone Igor Golovatenko, also in his Covent Garden debut, showed signs of succeeding the late great Dmitri Hvorostovsky, who gave towering performances in the role. At times, though, the voice sounded less burnished and more rough edged than one might like. Germont is a stern, stiff character, but he can be livened up by a more nuanced approach. Eyre’s production has held up well. The party scenes still offer flair balanced by charm. The rundown country house used for Act II looked a bit drab, but its unprepossessing character only helped to highlight the principals as they emerged in their fullest relief. Paul Wayne Griffiths led a measured performance. William Spaulding’s chorus delivered the opera’s crowd scenes with style and splendor.